26 wide-ranging wildfires took hold of forest, plantations and fynbos in June 2017 when, struggling under drought conditions, the Garden Route environment was tinder dry. Expecting stormy weather with the chance of good rain for the first time in a long while, no-one along the Garden Route was prepared for the magnitude of the drama that was to unfold in the days to come. 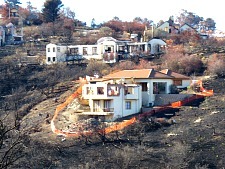 While specialists in the front line would fight with their very lives on the line to save people, pets, homes, businesses, farms, livestock, plantations and countryside, a well-stream of ordinary people would swell and go to extraordinary lengths to provide back-up support and comfort for the action teams and the victims of the worst fires to occur in the area since 1869. IMPORTANT INFORMATION FOR ALL THOSE WHO HAVE BEEN AFFECTED IN SOME WAY BY THE WILDFIRES AND NEED RELIEF ASSISTANCE. Rebuild Eden Sedgefield has moved to 4 Swallow Drive-next door to La Piazza at the circle just down from Sedgefield's only traffic lights. Open between 10am -4pm Monday to Friday. For assistance contact the people with cell numbers listed below. Directions: From Knysna turn left off the N2 at the traffic lights/from George turn right. Drive down to the circle and turn left into Swallow Drive. Just beyond La Piazza and in the middle of that block is Rebuild Eden. Ongoing assistance is still available from any number of folks on duty at Rebuild Eden when you arrive. e.g. Lesley, Nikki, Petro, Craig, Loopie, Thuys or Vinessa. i.e. food, clothing, bedding, etc. You can also phone ahead so that what you require can be organised for you beforehand and will ready when you arrive. Find more info on their Facebook page here. This Community Support Forum is ongoing until notice is given here that it is no longer operational. In the early hours of Wednesday morning 7 June, two wildfires galvanised by high speed, north westerly berg (hot) winds gathered momentum in outlying rural areas of Sedgefield and Knysna. They roared across the landscape jumping into tree canopies as merciless tsunamis creating a furnace beneath them that sucked the oxygen out the air and sent burning branches plunging into the underbrush below. The speed and intensity of the wildfires made it extremely dangerous for fire fighters to get close enough to have any impact on the storm. Deep in a forest a young engineer, Tony (an acknowledged expert in survival skills) along with his pregnant wife, Madre and young son, Michael were trapped by the blaze and became the first victims of this ferocious inferno. Only a few months previously, Tony had given my sister valuable advice, saving her thousands of rands, with regard to renovations on the old house she had bought on the Island. 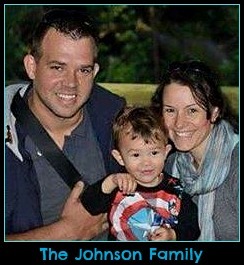 This was a much loved family in the local community and will be sadly missed. Our consolation is they did not have to suffer the pain of separation; they are together now as they were in life. 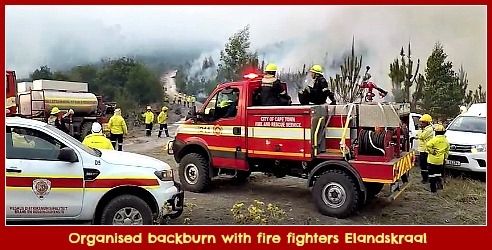 With wildfires burning from Groot Brak to Plettenberg Bay and beyond to Port Elizabeth, there was initially insufficient local manpower to attend to them all. Each town was trying to cope with fires closest to them. Knysna was in the thick of it and the most threatened town. It became the centre for the largest Incident Management Team ever assembled in South Africa. 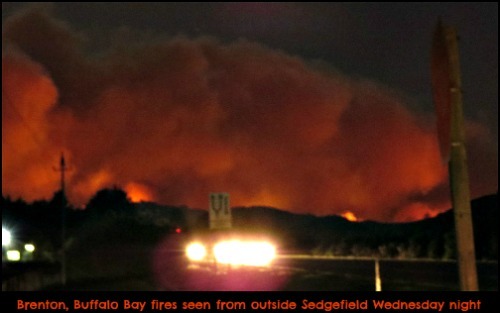 over 1200 regular and volunteer fire fighters including Working on Fire teams. 6 SA Airforce Oryx helicopters. and emergency services crew members from all over the country. In Sedgefield, despite threats of fire looming on the horizon and the town being engulfed in claustrophobic choking smoke at times, a local support team emerged to provide all the necessary backup to those fighting the wildfires and those who were becoming the victims of them. Facebook media a la “Sedgefield Locals” and “Knysna fires 7th June” came into its own informing people as to what was happening on the ground. This resulted in local volunteers arriving in droves offering - hot soups and places to stay, clothing, blankets, to fetch and carry anyone or food to where they/it was needed. A number of people put their day jobs on the back burner to become the mainstays overseeing the different functions of disaster management and as leaders, arose to co-ordinate the efforts of the “worker bees” effectively. 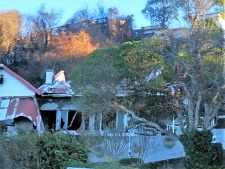 Belinda Hobson of Sedgefield Tourism was first into the fray and the Community Town Hall became the centre for the disaster relief effort. She drew upon the skills of Mike Hofhuis (the Ratepayers Safety and Security Representative) and Michael Simon (Community Policing leader) to co-ordinate efforts to support the fire crews and the evacuations of people from fire threatened areas. Michael also became the reliable voice on social media as he liaised with those on the front lines and was able to keep the general grapevine updated. With the road closed between Sedgefield and Knysna as wildfires jumped from the north side of the N2 to the south side and flames speeding in leaps and bounds towards Belvidere and Brenton, Mario Ferreira in Sedgefield was called upon by Knysna Disaster Management to orchestrate an operation to rescue people, many of them elderly, that had been instructed to evacuate their homes but who had no other option at that point than to walk along the beach towards Buffalo Bay. 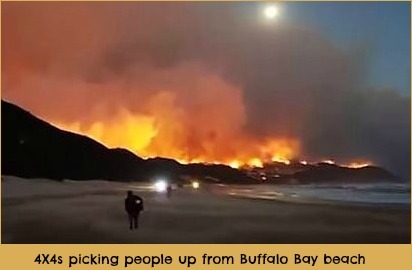 After managing to round up 30 4x4’s Mario’s group began to ferry some 400-500 people and their pets to Buffalo Bay restaurant and when the road between Knysna and Sedgefield was opened, they were eventually able to bring them to the safety of Sedgefield. This operation lasted many hours, from Wednesday mid-morning until 3am Thursday morning. Temporary accommodation was provided for Elandskraal and Fairview evacuees at the Town Hall, Sedge Christian Church and the Sedgefield School Hall. For those arriving from Buffalo Bay, private homes and Pine Lake Marina opened their doors. A number of frail care people were accommodated at Masithandane’s HUG House Respite Centre. Dr Venter assisted those who needed medical attention and numerous counselors offered their services to traumatised evacuees.Where families had been split up in the evacuation process volunteers assisted to reunite family members and to notify anxious family living elsewhere that their Knysna family were safe. Almost immediately people started pouring in to the Town Hall Relief Centre, many now owning only the clothes they were wearing so they needed clothing, bedding and food. As sacks of relief aid had not been sorted yet, it was a bit chaotic at first. There was plenty of soup and sandwiches but limited containers to put it in! A visitor, Patrick Walton with logistical skills provided help with planning storage and distribution and drove needed supplies and food to the front lines. Later Gary Atkinson came on board as a relief at the town hall, also manning the fire station and assisted as a driver. Riana Hanekom, Amanda and Mark Dixon monitored all aspects of the comings and goings in the town hall while using their own cell phones and airtime to phone far and wide to source needed supplies, accommodation, storage facilities and whatever else came up as an emergency. Massive truckloads of relief supplies were constantly arriving from generous-hearted individuals and companies from all over the country, even from as far afield as Namibia. Numerous back-up people relieved the mainstays to give them a break as the hall was a constant hive of activity from early morning until late into the night. As systems were established and refined, people slotted into places where they could alleviate the crisis brought about by these catastrophic wildfires. Fresh volunteers responded to calls for assistance to off-load tons of goods delivered by using economical chains of people to take them from the truck into the hall. This happened frequently at all times of the day and into the night. Goods then needed to be sorted and stored in readiness for redistribution as required – another mammoth task. 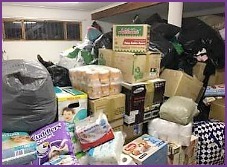 Eventually the quantities of donations increased to such an extent that different categories of goods such as clothing, bedding, groceries, toiletries, toys and books, bottled water, furniture, etc. were each placed in their own warehouses in the form of rooms, buildings or halls offered by local owners, while awaiting distribution. Other folk who made an enormous impact by supplying quality food to fire fighters, evacuees and day-long volunteers were Anita Van Rensberg from Montecello, Ian Perriman from Pelican Lodge and Colin Capon-retired International Celebrity Chef. Many coffee shops and private individuals also did their bit assisting the main chefs. Afternoon peel and chopathons brought local volunteers to the hall to chop up fresh vegetables to be cooked for up to 260 meals at a time and twice a day for some periods. People offered space in their deep freezers to keep excess perishable vegetables and cooked foods and gave assistance with cooking meals. Meals were then plated in polystyrene containers by volunteers in the town hall kitchen and either collected or delivered by volunteer drivers to the fire fighters and evacuees wherever they happened to be. 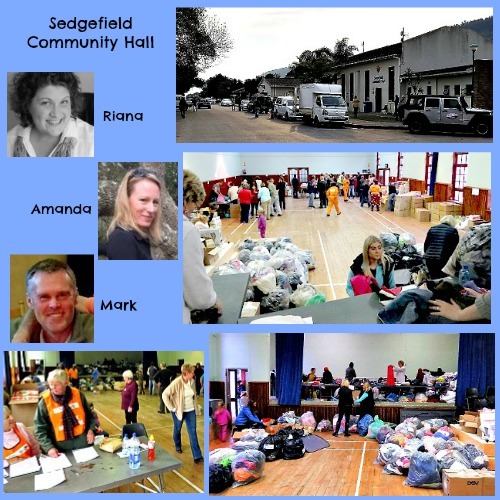 The Sedgefield townsfolk have been a vital part in the overall effort to alleviate the human anguish and upheaval suffered in the catastrophic wildfires along the Garden Route in June 2017. It was both humbling and heart-warming to witness first-hand the charitable response of the community to the crisis. Across the spectrum of age, abilities, religion, colour and race, people united to contribute however they could. 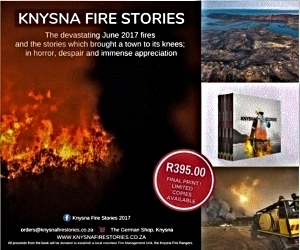 The above book is now available at Rebuild Eden Sedgefield with amazing stories across the spectrum of all the people whose lives were a part of the human drama created by the disasterous 2017 Garden Route wild fires. It reminds me of these insightful words by Albert Einstein. Of the former – the qualities of kindness, compassion, love, understanding, patience, cheerfulness, determination and perseverance evidenced as people worked together, supported each other and those affected by the disaster is what I will remember beyond these calamitous days. 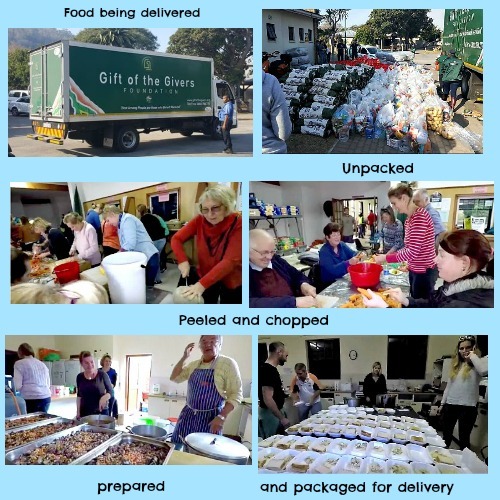 The volunteers were assisted by an outpouring of generosity from organisations, companies and individuals from towns and cities throughout South Africa, other countries, and other continents that was overwhelming. This page is to recognise and applaud the contribution of hundreds of Sedgefield Community Volunteers, the majority of which cannot all be named here, during this whole scary, challenging and unthinkable disaster of wildfires in our beautiful Eden we call the Garden Route. Bomber, Editor of the Edge Community Newspaper Issue 515 & 516 who's always involved in the action and helping out where he can. 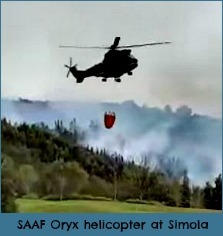 The Oryx helicopters with their bambi buckets were capable of dropping over 2000 litres of water at a time. In a matter of days they had dropped over 1,000,000 litres of water onto fires even though they could not fly in the dark or in high wind. They contributed hugely to putting out fires and reducing the danger in many instances for the battle weary fire-fighters on the ground. A spotter light aeroplane flew high above to supervise them acting as eyes to guide them to the worst fire spots while at the same time relaying information to the fire boss on the ground. 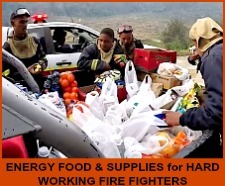 The owners of our local Pick 'n Pay gave donations of bottled water, energy drinks, energy bars, chocolates & lip-ice specifically for the fire fighters and many other types of goods when asked if they could help. 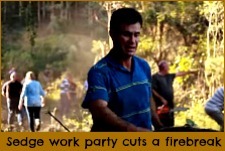 Local Sedgie folk also took matters into their own hands when things started looking threatening on the Goukamma side and they organised a work party to cut a fire break at the bottom of Fraser Street. It was a worthwhile precautionary exercise. Fire fighters later said that the fires in Goukamma were amongst the fiercest they had ever encountered. 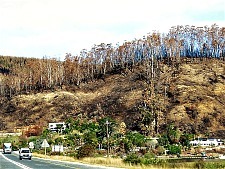 When the wind died down on Sunday evening 11 June, the Fire Chief made a strategic decision to orchestrate a back burn near Sedgefield towards the already burnt area of Goukamma to create a firebreak that would thereafter minimise the risk of wildfires reaching Sedgefield. Based in George, the Carpe Musicam Orchestra that has a number of local Sedgie musicians in it, held a benefit concert in Sedgefield at the NGK Hall on Friday 23 June for victims of the wildfires. 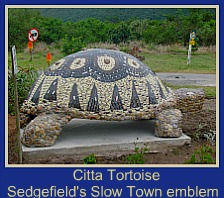 Pets, horses, cattle, wild animals, tortoises, birds and bees were not forgotten. Sedgefield Animal Matters (SAM), Knysna Animal Welfare Society (KAWS) and George SPCA were involved in rescuing and housing animals left behind or lost in hurried evacuations and looking after pets that couldn’t be housed by their owners. Local vets were on standby to assist injured animals. A number of people with horse boxes relocated horses in danger areas to safer places. Greengold Animal Feeds Mooreesburg has provided much needed feed for livestock. Feed has been put out for bushbuck at Brenton that have lost their food source, also for baboons, and bird feeders have been placed for localised birds in the same area. Gift of the Givers provided honey to Owen at Honeychild Rheenendal for distribution so that beehives that have survived the destruction can be taken care of through the winter. 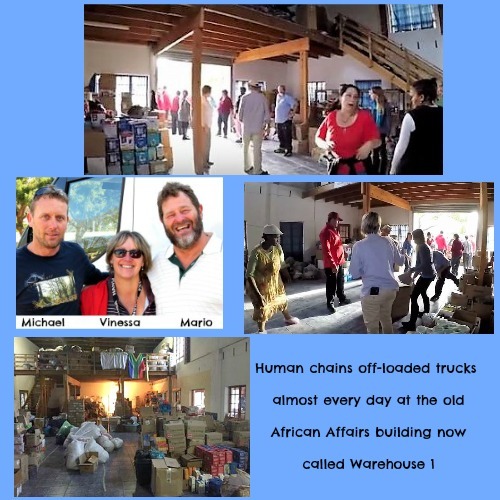 By making contact via Stuart Lidstone, Barrie Hardie of Redfern MOTH Shellhole based in Sedgefield, received 7 vehicle loads of relief supplies from the generous hearted Langebaan, Vredenburg and Saldhana communities on the West Coast 700 kms away. The Naudes who were owners of two family run businesses in Langebaan prepared to use their 7 vehicles to bring the donated goods to Sedgefield. On their arrival, volunteers helped sort the blankets, clothing and food. Seven bakkie loads were then trucked to the Town Hall and old African Affairs building for distribution or storage. 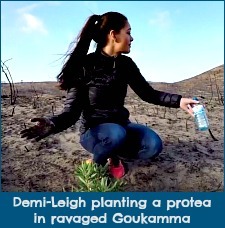 With support from Cell C and Sun International, Miss South Africa 2017, Demi-Leigh Nel- Pieters, a local Sedgefield girl created an opportunity for people to donate financially towards the disaster here. 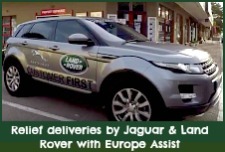 This fundraiser amounted to over ½ million rand within 2 weeks. Sedgefield Lions are managing and allocating these funds. 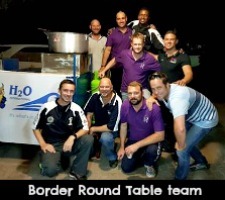 Lions clubs around South Africa trucked goods for disaster relief to Sedgefield. 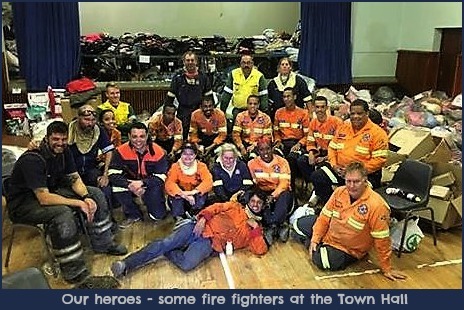 A Round Table Team from East London traveled to Sedgefield with their own supplies and cookers and worked through the night at the Town Hall to provide hot nourishing meals and TLC for hundreds of battle weary fire fighters. Hundreds of Tupperware products were delivered in boxes to Warehouse 1 and repackaged in gift packets by volunteers for wildfire disaster victims in July '17.